The Peoples Democratic Party (PDP) has claimed to have uncovered a plot by the All Progressives Congress (APC) and a group in the Presidency to use security agencies and the Economic and Financial Crimes Commission (EFCC) to invite, arrest and detain the President of the Senate, Bukola Saraki and his deputy, Ike Ekweremadu. The PDP also claimed it had unravelled fresh facts confirming that the pressure by the Presidency for the reconvening of the Senate was out of an alleged sinister motive and not for any emergency in the approval of the budget of the Independent National Electoral Commission for the 2019 elections. The former ruling party said in a statement by its spokesman, Mr Kola Ologbondiyan, in Abuja on Sunday that the alleged fresh plot to detain the two presiding officers was part of a renewed design to keep them out of circulation, ahead of Senate’s resumption. 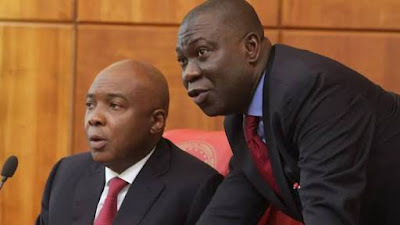 The detention of the duo, he said, would enable those he described as “the APC senators,” who he said were in the minority, to produce two of their members as Senate President and Deputy Senate President on the excuse that Saraki and Ekweremadu failed to show up for proceedings in the Senate on Tuesday. He also alleged that the government was planning to use the EFCC to harass members of the families of the presiding officers of the Senate. Ologbondiyan said, “The PDP notes that the new plot to cage Saraki and Ekweremadu in a devilish rehash of the Tuesday July 24, 2018 hostage-taking and invasion of their official residences by security agencies is coming after the August 7, 2018 failed attempt to use security forces to take control of the leadership of the Senate. “Apart from the plot to arrest and detain Saraki and Ekweremadu, the PDP has also been made aware of plans to use the EFCC and security forces to clamp down on their family members, including their wives and siblings as well as close associates, all in the effort to weaken their resolve. Ologbondiyan added that the PDP was further informed that contrary to claims by the APC and the Presidency, INEC actually submitted the budget to the Presidency in February 2018, only for the Presidency to submit it to the National Assembly in July when the legislature was already going on recess; with a view to enmesh it in a needless controversy. He called on the Acting President, Prof. Yemi Osinbajo, to stop acting as a saint, saying that Nigerians were aware that he was part and parcel of the actors behind the sordid developments playing out in the National Assembly. Ologbondiyan called on Nigerians and the international community to note the alleged activities of the APC and the Buhari Presidency, which he said had continued to put the unity and stability of the nation and democracy under serious stress.